The Woods Hole Oceanographic Institution (WHOI) operates a system of three medium-range Seasonde HF radars on the southern New England shelf capable of observing the ocean environment at ranges up to 45 km. 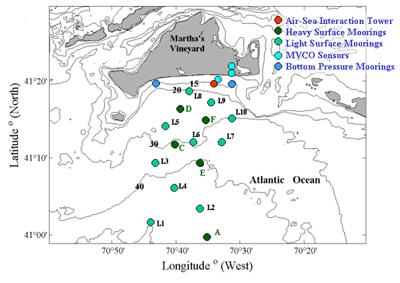 The overall objective of this project is to understand the processes controlling the seasonal variability of phytoplankton biomass over the inner shelf off the northeast coast of the United States. Researchers from WHOI and the National Center for Atmospheric Research (NCAR) deployed an array of sonic anemometers at the Air-Sea Interaction Tower (ASIT) south of Martha's Vineyard to investigate wind-wave interactions and their effects on climate variability. 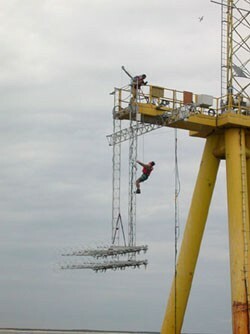 The array, suspended below the 12-meter ASIT platform, was composed of two levels with nine sonics each at about 5 and 5.5 meters (16-17 feet) above mean sea level. Three laser altimeters were also deployed from the platform in a 2-meter triangle to collect information on the underlying wave field. Data collection from these arrays began in early August 2004. Sponsored by the National Science Foundation (NSF), this project investigated the physical processes that generate and/or modulate the turbulent transfer of momentum, heat, and mass through the atmospheric surface layer. Of primary interest was the influence of wind-generated waves on air-sea fluxes and the marine surface layer. The ultimate goal was to improve how these wave-induced processes are simulated in numerical models. 1. 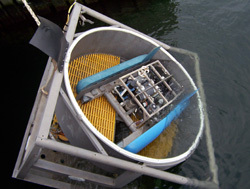 To provide high temporal resolution (one profile per hour) water column data on temperature, salinity, light transmission, up- and down-welling irradiance at five wave lengths, chlorophyll fluorescence, CDOM fluorescence (Dissolved Organic Matter), dissolved oxygen, and phyto and zooplankton composition and abundance at a vertical resolution of 1 cm or better. 2. To provide preliminary data on the usefulness of a permanent profiling system at the MVCO site. The purpose of this system would be to detect the effects of stratification on the vertical distribution and composition of the plankton community in relation to strong wind events and data from remote sensing platforms. Coupled atmospheric and oceanic boundary layer dynamics were investigated at low wind speeds where processes are driven and/or strongly modulated by thermal forcing. During the intensive operating periods in the summers of 2001 through 2003, investigators collected data near Martha's Vineyard from the Air-Sea Interaction Tower (ASIT), aircraft flights, satellites, mooring arrays, and ship deployments. CBLAST-Low was funded by the Office of Naval Research (ONR) and included participants from the National Oceanic & Atmospheric Administration (NOAA), the University of Washington, Oregon State, Columbia University, the National Center for Atmospheric Research, the Naval Postgraduate School, Johns Hopkins University, the University of Wisconsin, the University of Leeds, and the National Aeronautics and Space Administration (NASA).